Due to recent and shocking scientific discoveries, it was announced to the public that there is, in fact, water on Mars! And not just bulking, boring blocks of ice. We’re talking real, flowing water. On Mars! Read more to find out about this shocking discovery. The first life experiment on our red friend was back in the 70s, with the twin Viking Landers. They were the first to not only touch down on Mars, but also the first to conduct experiments to see if there were any organisms living there. They returned with a hard “maybe.” Not much more work was done after that vague response. Slowly, the Life on Mars! headlines began to drift away with the passing of time and interests of the masses. 15 years later, though, NASA finally decided to resume the exploration of life on our neighboring planet. 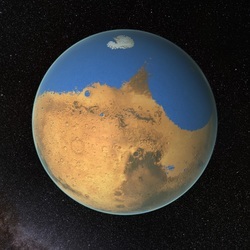 However, they tweaked the focus of their data; instead of looking for Marvin the Martian, they decided to look for good, habitable conditions on Mars, either in the past or the present. In 2011, though, scientists made a shocking discovery. The Landers from earlier may have actually stumbled on something very important. There’s a possibility that these spacecrafts could have found organic materials that are necessary for the means of life. This recent data shows that not only could Mars be potentially habitable now/before, but also could mean that there is life on Mars as we speak. In addition to the news of essential water, it’s pretty clear that we astronauts need to go to Mars almost immediately. But, the question is, how can we avoid potentially harmful contamination on both planets, and comply with the precedents of the Outer Space Treaty? Excellent question. Actually, that’s what the scientists are trying to figure out. First things first, though, we need to make sure that the spacecraft is almost completely sterile. There are several ways to do this. The first way is the baking process. Similar to the Viking mission, this spacecraft en route to the red planet needs to be roasted at about 260 degrees Fahrenheit in order to comply with the cleanliness standards. With this extreme heat, the material this craft is made of needs to be extremely heat resistant. Even past the heat, chemicals, and UV Rays, there’s still bound to be plenty of bacteria on this thing. Not to mention the cost. What with NASA’s dwindling money supply, it would be extremely difficult to make a spacecraft that is capable of withstanding all of this security. A second idea would be the opposite of what’s listed above; extreme cold. Project Icebreaker, another brainstormed idea, plans to drill into Mars’s ice supply. Scientists predict that there may be some ancient remnants of life in the frozen ice beds. But how does this machine stay sterile throughout this process? The robot was projected to have self-sterilizing treatments built-in, but how would that work? Would the machine still be able to resist extreme temperatures? Will that be cost-effective? These very questions above are perhaps the most important questions for the advancement of space. NASA intends to send human astronauts into space around the 2030s, but will they be able to complete the dangerous task? If you care about this topic as much as I do, feel free to brainstorm any ideas that you think could solve the scientists’ dilemma. With our brain power, and theirs too, perhaps we could all work together to finally visit the Red Planet, once and for all.